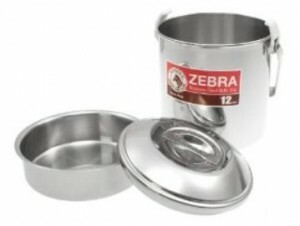 If you’re looking for camping cookware which can handle considerable punishment, Zebra billy cans are ideal. They come in four sizes. 10cm, 12cm, 14cm and 16cm. The 10cm and 12cm cans are ideal for one person, the 14cm for two, and the 16cm for three to four. As you’ll see in the image, they also come with what looks like a dog bowl, which fits inside the main pot held on the rim. This allows steaming, smoking meat, cooking two layers of food or as a plate or shallow bowl. Hang them from a tripod over a fire (the handle has a curve in the middle allowing this), pop them on a camp stove or lay them on their side and even use them as an oven to bake bread, these are versatile pots which will take years of abuse. Expect them to discolour slightly after use, but that just adds to their character. The 14cm can is an ideal size to snugly hold a wood gas stove during transportation. Due to its height and unlike a normal pan with a standard handle, we find this more stable on a smaller stove allowing safer cooking. 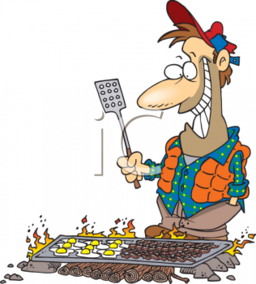 A design flaw is the plastic clips used to hold the handle upright – these melt if the pan is on a campfire. Take them off when cooking. The issue with the clips is not enough to detract from just how good a piece of kit this is. Some complain that the handle gets hot. Use a stick to lift the billy can when you’re ready to serve. Set it on the ground, and then use the stick, gloves or an oven glove to lift the lid. It’s not rocket science. Stainless steel gets hot! If not cooking with the lid on, you can also use an aluminium camping pan grip which are cheap to buy to handle the pot. This can also be used with the internal pan, and hey presto, you then have a mini frying pan. In the following video a zebra billy can is used as an oven to roast a whole chicken on a small spirit burning stove. We know of people who use theirs to bake fresh bread in the morning. Please note the zebra can in the video has a minor modification, in that the plastic clips have been replaced with sprung wire. You need to light a fire with something. Matches get soaked, flints fail on lighters and the fuel runs out. You need a reliable backup when camped away from shops and civilisation (hammocks strung outside ASDA tend to get funny looks). What are magnesium fire strikers? Black metal rods with a thumbnail sized plastic handle. The rods are made from magnesium and have a strip of flint running down one side. When you need to light a fire, you shave little pieces of magnesium off the stick onto tinder, and then strike the other side of the stick with the attached green metal rectangle. Hey presto… fire. You shave the stick and strike the flint using a hard metal object. Most sticks come with a striker. 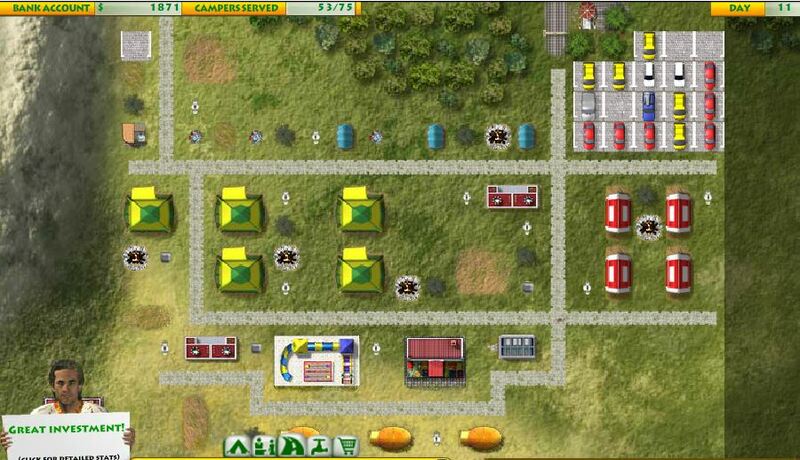 The striker in the picture is the green rectangle. People either love or hate these magnesium fire strikers. The main reason for people not liking them is no-one having explained how to use them. 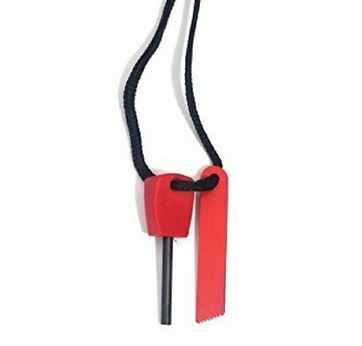 Unless you know that a new fire striker has a thin plastic coating which needs scraping off first, your first couple of attempts at using the striker will bring disappointment. Put simply “plastic don’t throw a spark!” We believe many a cheap striker has been unfairly thrown in a bin. As with any new equipment, play with it before it becomes a necessity. Get to know it, how it feels, and feel comfortable using it. Isn’t that half the fun. Make a spark, light a bonfire or your barbecue. Do it in the garden and not in the living room, or you’ll have your daughter tell you off. Trust me… they do. Another tip? You’ll find it easier making a spark by using the back of your knife to strike the flint rather than the soppy piece of green or orange metal provided. Some strikers work better than others, and I was surprised at how effective a tiny one was which came with my knife. When you check on Amazon, it gets a 5 star rating. 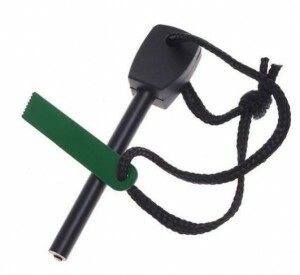 It’s called the Mini Magnesium Flint Fire Striker Spark Lighter (a bit of a mouthful) by AoE Performance. Well worth the investment and having this tiny striker as a back up. If anything, buy two. My spare hangs from a carabiner on my tarpaulin ridge line. 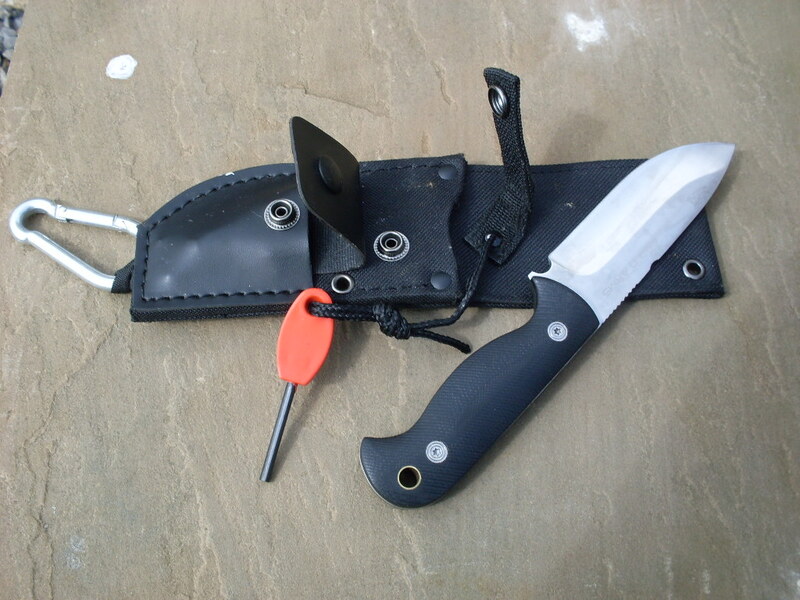 The second is in a pocket in my knife sheath. At £1.49 each, they’re a bargain (and so small there’s no excuse not to carry two!). Striking a spark onto wood or coals directly is going to cause you frustration. You need either tinder or good firelighters. Tinder is anything which catches a flame easily. It can be grasses, wood shavings, feather sticks or firelighters. Make life easier and take home made firelighters. These take a spark from a fire striker and give you a lovely ball of flame (even without magnesium shavings). See our post “Tips for Firelighting: Vaseline“. These are fantastic, and hold a flame far better than shop bought fire lighters, even in the wind and when it’s wet! Don’t expect a fire striker to get logs burning, even when using firelighters. Those firelighters need kindling heaped on top before you’re piling up the logs! I keep a small sack of kindling in the boot of the car. You can buy one from most petrol stations (at least you can in my part of the country). Nothing is worse than setting up camp in rain and finding no dry wood to burn. A sack of kindling will give you enough wood to at least cook on for a night. If you’re camping with children, send them off gathering sticks. Break them off into 6” to 1foot long pieces, and put the thinnest on the fire lighter first when it’s blazing. You’ll be good! A fantastic value for money, multi-purpose knife for under £15.